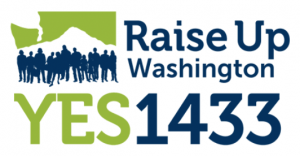 In March TRU endorsed Initiative 1433, to raise the minimum wage and guarantee paid sick leave for workers throughout Washington State. The clock is ticking to gather enough signatures before the June 30th deadline. This month TRU members and friends will be helping to gather signatures. Join us! 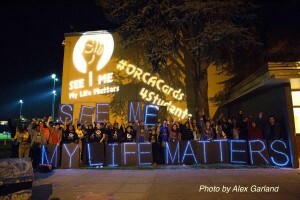 Check our calendar for details, or volunteer directly with the Raise Up Washington campaign. 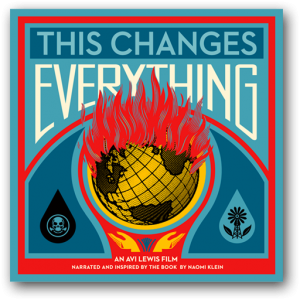 Hillman City Collaboratory, 5623 Rainier Ave S.
This Saturday, come on out to the Hillman City Collaboratory for a community screening of This Changes Everything, the 2015 documentary film based on Naomi Klein’s best-selling book on climate change and the need for a radical social and economic transformation. TRU is hosting this free event in collaboration with the Meaningful Movies project. There will be popcorn and other refreshments, and the movie will be followed by a discussion. RSVP on Facebook and invite your friends! Sunday, May 1st is International Workers’ Day! TRU will be rallying and marching in solidarity with workers and immigrants in the annual rally and march organized by El Comite, and we invite you to join us. We’re also launching the spring issue of our Transit Reader newsletter that day. 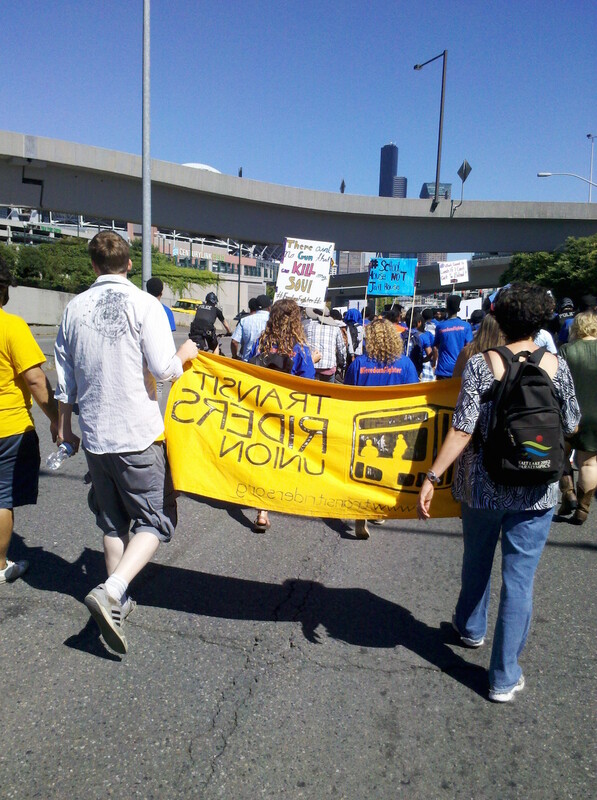 3 PM – March begins, proceeds to downtown Seattle. TRU will have our table set up in the park from 1-3 PM, so come by to say hi and grab a free copy of the Transit Reader! We’ll also have copies of the Seattle Transit Map, and balloons for the kids. After that we’ll be marching with our banner, and we’d love to have you join us! 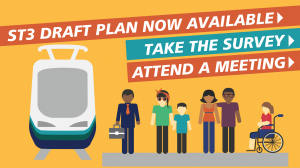 UPDATE: Monday, May 2nd Friday, April 29th is the last date for public comment on ST3, the 25-year, $50 billion light rail expansion package that will be heading to the ballot this November. Click the image at the left to visit the ST3 website, where you can read about the package, take a survey, and find details of public meetings. Speed up the timeline for an infill station at Graham St.
Add funding for a station at 130th St.
We won! Light rail access for riders who rely on tickets! 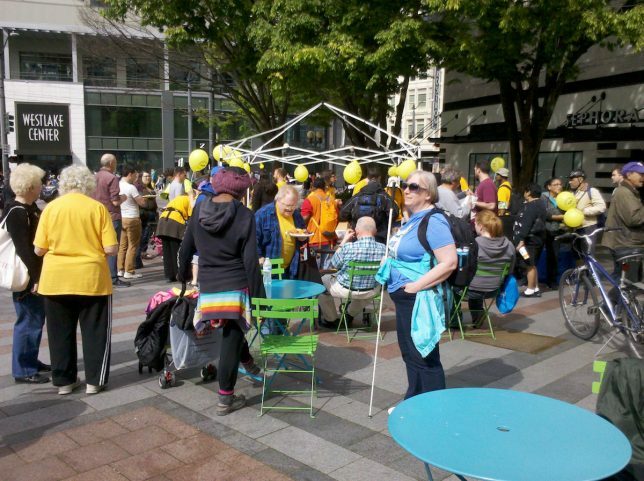 Transit Riders partake in a community meal at Westlake Park before heading to the train. 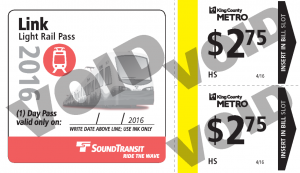 Starting in June, social service organizations will be able to purchase these “combo-tickets” to distribute to very low-income and homeless riders. Until then, organizations that purchase light rail passes will receive bus tickets for free. Thank you to everyone who signed our petition and helped us to win this campaign! TRU will continue to push for more tickets to be available to organizations at a lower cost, and for monthly ORCA passes that are affordable and accessible for very low-income and no-income riders. 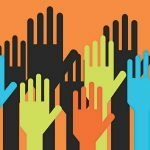 Join us – together we can win! 1 Comment on We won! Light rail access for riders who rely on tickets! Starting mid-June, social service organizations will be able to distribute these new “combo-tickets” so that riders who rely on tickets can ride the light rail as well as buses. 4:00 PM Ride the Rail! ** UPDATE ** Metro and Sound Transit have announced their short-term fix! They have also provided us with light rail day passes for our event on Saturday. Join us at Westlake to celebrate! 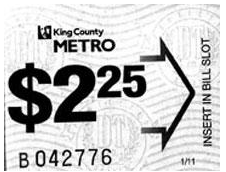 Thousands of riders in King County rely on bus tickets from social service agencies. But, these tickets aren’t accepted on Link Light Rail. Especially since the March 26th bus service restructure, these riders are being left with a second-class transit system. In 2015 the ORCA LIFT program that TRU and others championed brought welcome relief from high fares for low-income riders who can afford $1.50 per ride, or $54 for a monthly pass. But for riders with very low or no income, this is still unaffordable. And it’s these people who are most reliant on public transit – to get to work and job interviews, to school, to medical appointments, and to access basic necessities like shelter and food. In January, the Transit Riders Union and the Our City Coalition called upon Sound Transit and Metro to find a solution that doesn’t create a two-tier transit system and is affordable for all. Join us on April 16th for a community meal, rally and direct action to turn up the ????HEAT!???? UPDATE: Since we announced this action, Metro and Sound Transit have responded to say that they are working on a solution. Depending on what has been accomplished by April 16th, our Action may become a Celebration… come find out! Welcome to the new Transit Riders Union website! The old site served us well for the past 4 years, but as TRU has grown so have our electronic needs, and so we must discharge our old friend from duty. Please excuse us while we finish updating some of the content. And if you find any broken links, or otherwise have any suggestions, just send an e-mail to our volunteer webmaster scott@transitriders.org. 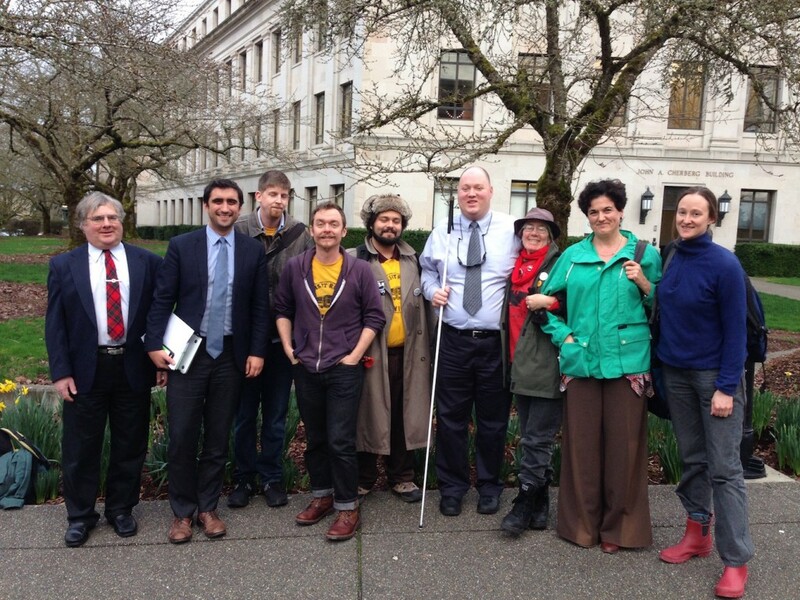 Non-Residential Parking Tax bill (HB 2186) gets a hearing! On Thursday, February 18, the House Transportation Committee will hold a public hearing on HB 2186, which would grant local authority for a Non-Residential Parking Tax (NRPT)… please come down to register your support: 3:30 pm in House Hearing Room B in the John L. O’Brien Building. Take our 2016 Transit Rider Survey! TRU wants to hear from you. How do you use the public transit system? What could be changed to improve your riding experience and your quality of life? What transit issues do you care about most, and what campaigns do you think TRU should focus on this year? Our 2016 Transit Rider Survey will probably take you 15 to 30 minutes to fill out, depending on how detailed you are with your answers. Thanks for taking the time to tell us what you think! The Long Walk Home: TRU Movie Night! You’re invited to a community viewing of The Long Walk Home! This 1990 film depicts two women, black and white, in 1955 Montgomery Alabama, who must decide what to do in response to the famous bus boycott. Doors open at 6:00, the movie starts at 6:30. There will be food! Bring something to share if you’d like. The event is family-friendly and free, though we welcome donations to help cover costs. You can RSVP on Facebook here, and please invite your friends! 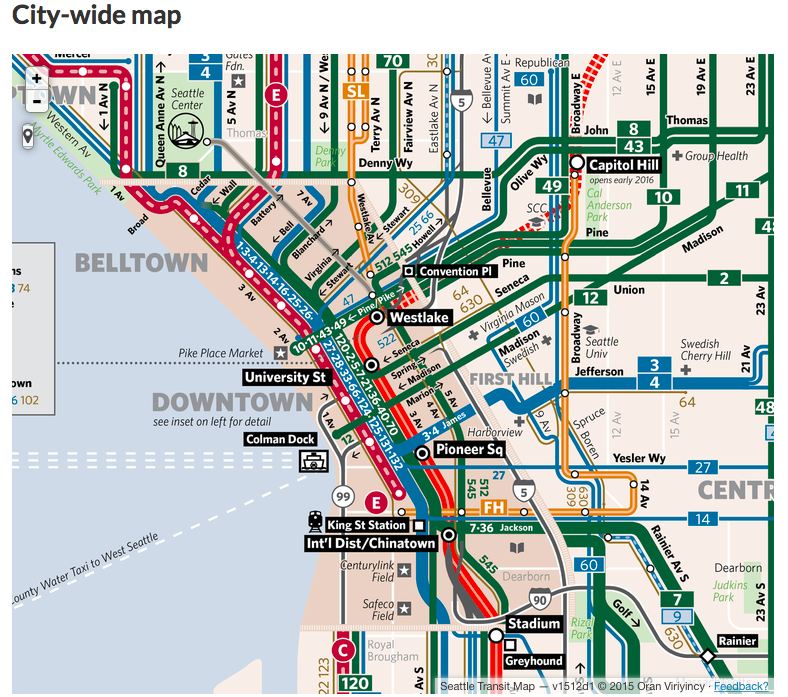 New Seattle Transit Map: Got Feedback? *Update* The Seattle Transit Map is printed! Read more and find out how to get one here. 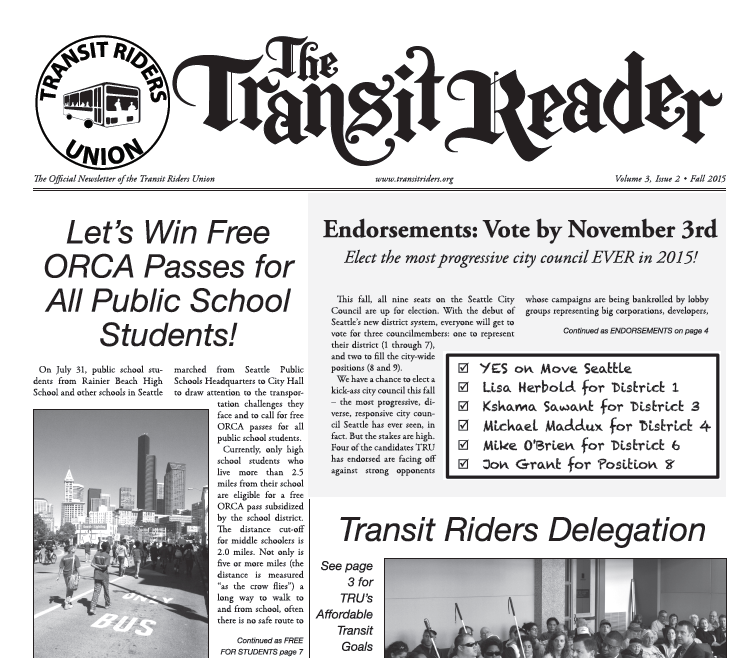 The Transit Riders Union is thrilled to announce a big victory in our ongoing Affordable Transit Campaign. The budget approved by the Seattle City Council on November 23 included $1 million to fund transit passes for low-income high school and middle school students. Thank you so much to everyone who worked on this campaign, to the more than 1,000 people who signed our petition, and especially to the courageous students at Rainier Beach High School students who organized a march to City Hall in July and an amazing Town Hall forum last month. But we’re not done yet. We believe that all youth in Seattle and King County should have year-round access to public transit. Enabling youth to travel freely to school, activities, and jobs will help to close the opportunity gap, break the school-to-prison pipeline, and combat climate change by increasing public transit use. We can win this, but it will require a strong and united community effort to secure cooperation between the city, the county and the school district to get it done. We are seeking students, parents, teachers and community supporters to help us move this project forward. If you are interested, please email us at contact@transitriders.org. 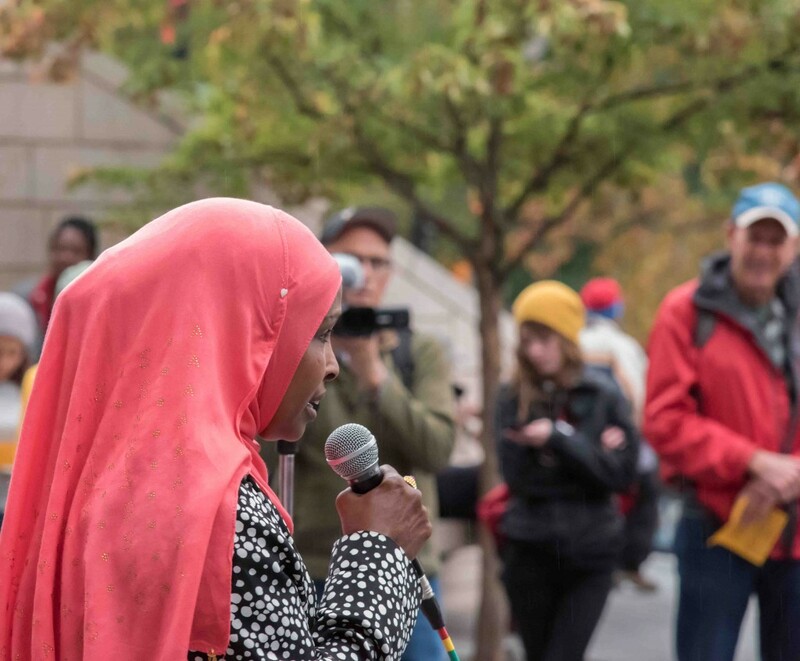 Tenant and housing activist Sahro Farah speaks! 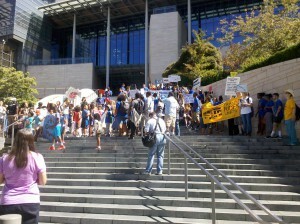 Rally to Make Seattle Affordable for All! Join us at a rally to bring some urgency and purpose to City Hall! 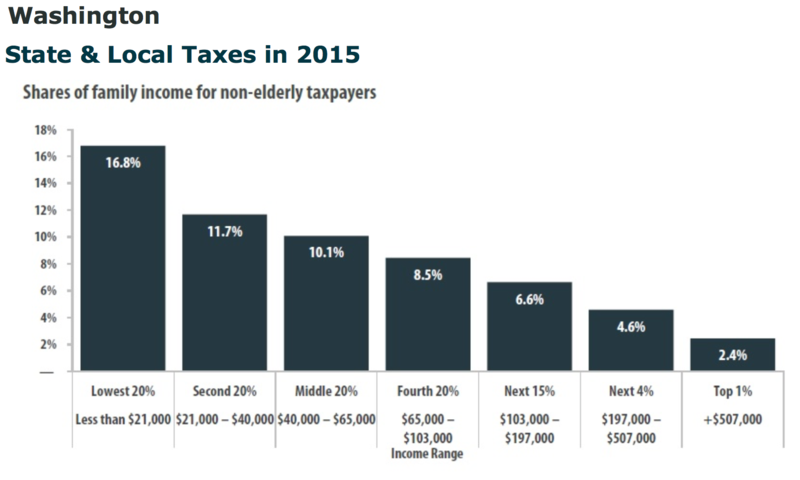 Seattle faces an unprecedented crisis of affordability. Rents are rising out of control, tents are pitched on every patch of grass, and working and low-income residents of our city are treading water if not drowning. 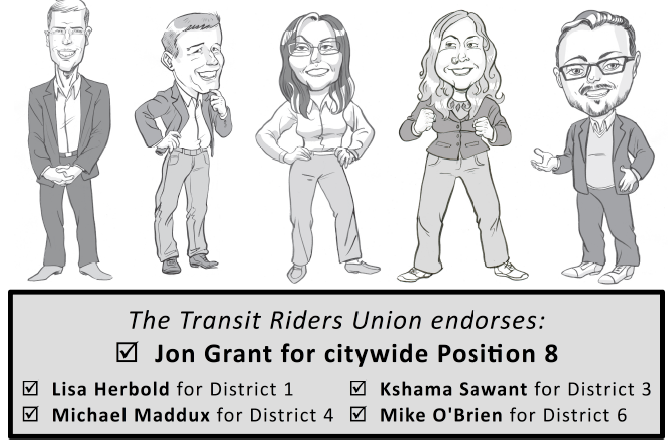 The Transit Riders Union has endorsed candidates in five of the nine races for Seattle City Council. Here are our endorsements! And you’re invited to our kickoff party on Monday, September 28th! This fall, all nine seats on the Seattle City Council are up for election. With the debut of Seattle’s new district system, everyone will get to vote for three councilmembers: one to represent their district (1 through 7), and two to fill the city-wide positions (8 and 9). This fall, TRU is campaigning to elect the most progressive city council Seattle has ever seen! We’ve endorsed candidates who we believe will represent us and deliver on issues such as better public transit, affordable housing, police accountability and ending homelessness – rather than acting in the interests of big money. We’re also encouraging a YES vote on the Move Seattle levy. You’re invited to our kick-off party! Come meet & hear from the candidates, talk about the upcoming elections, and sign up to volunteer with TRU if you like. And, there will be cookies! RSVP not necessary, but appreciated – scroll down and fill out the form to let us know you’re coming. The latest issue of the Transit Reader, TRU’s official newsletter, is out! Can you distribute copies on your buses or leave some at your neighborhood coffee shops or library branch? 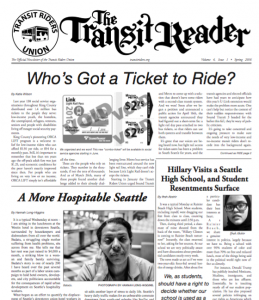 Email us at contact@transitriders.org or leave a message at 206-651-4282 and we’ll figure out how to get you some copies. What a crowd! Filling the steps of City Hall. On July 31, public school students from Rainier Beach High School and other schools in Seattle marched from SPS Headquarters to City Hall to draw attention to the transportation challenges they face and to call for free ORCA passes for all public school students. 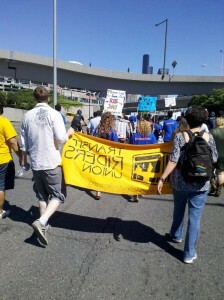 Beginning from SPS Headquarters in SODO, the march headed towards downtown. Currently, only high school students who live more than 2.5 miles from their school are eligible for a free ORCA pass subsidized by the school district. The distance cut-off for middle schoolers is 2.0 miles. Not only is five or more miles (the distance is measured “as the crow flies”) a long way to walk to and from school, often there is no safe route to walk, due to dangerous traffic or neighborhoods. 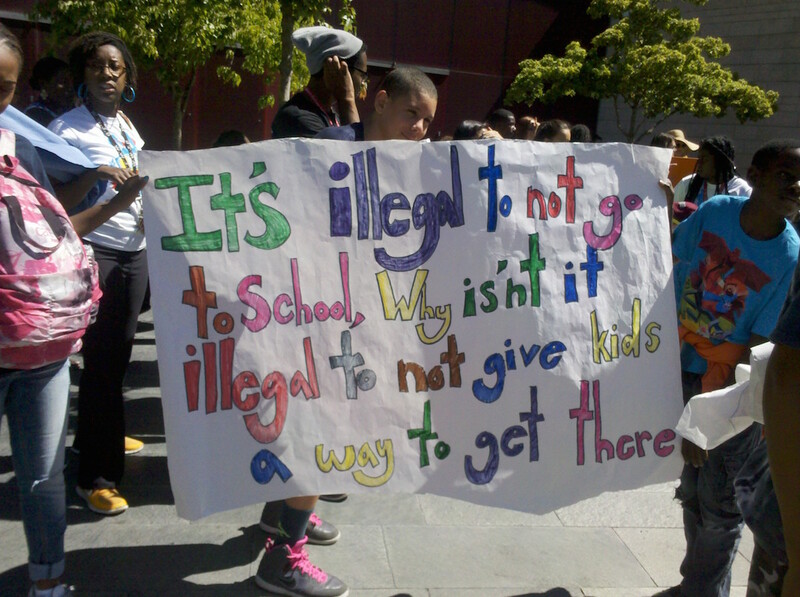 It’s illegal to not go to school, why isn’t it illegal to not give kids a way to get there?